I have to write this in the Queen's Inn tonight instead of my usual room at the Blazing Griffon. That one was destroyed when the wyvern crashed into it. Usually, our group seeks out trouble by tracking down bandits or dragons and whatnot. 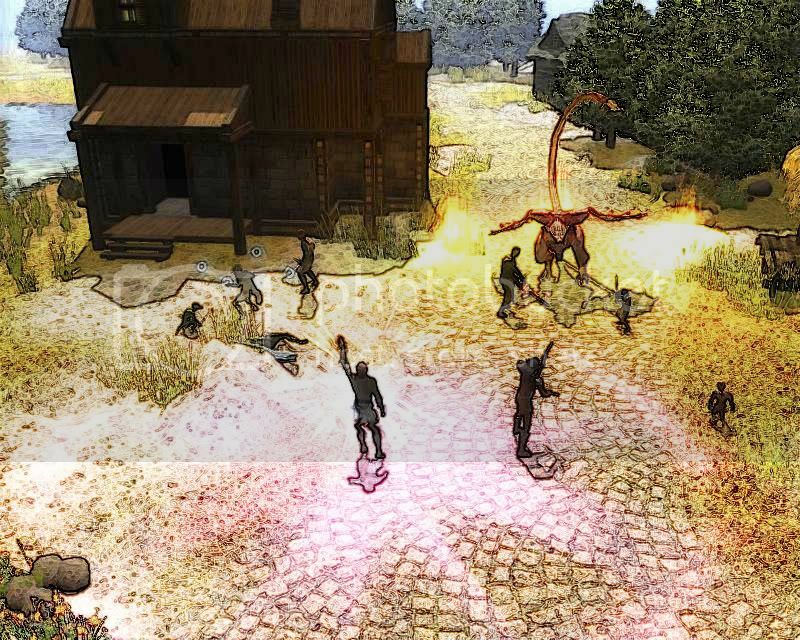 Today, however, it came to us; a few wyverns started diving into the town and picking off hapless humans for lunch. I really dislike going outside during the winter... but the sheriff did come to us and ask for help, so we could hardly refuse. It is a shame too. The wyverns are very pretty creatures; they have many of a true dragon's traits, such as thick scales and powerful wings. Oli seemed to recognize that as well since he showed interest in riding one. The hunt did not take more than a few minutes, but it was quite exciting. Two wyverns dove at us once we left the inn, so we dealt with them first. I took the chance to summon my first fire elemental in combat, and wow! What a sight! Can you imagine what it is like to see something so pure, so perfect? The being was made of nothing more than raw heat, but it moved with such direction and purpose. It had no hesitations or questions of morality; it simply stepped toward the wyvern (melting the snow as it walked) and slammed it over and over again. Its only desire was to burn, and it did that very well. While my elemental was having its fun, Legeand was engaging the wyvern in melee. Oliveryn must have thought this was a bad idea or something, because he cast a spell that put Legeand out of his mind with fear. I had to dispel it before Leggy's pride was hurt too much. Some empty threats were exchanged: pretty typical. I just wish everyone would take these things in stride rather than getting needlessly angry. We put down the beasts without too much trouble. But that is when a third wyvern took a wrong turn on its dive attack and crashed into the inn. You would think that was the end of it, but no! Out of the rubble stepped Gaedracis the gnoll, now a lich. Diplomacy with him was never really an option. We attacked, and he shot a black ray at Luanes, draining the strength from her. That kind of necromancy is very chilling, albeit effective. If it could make the paladin barely able to hold onto her sword, I have to wonder how it would affect one like me? I hope I'll never have to find out!